I was SO in the mood - to make valentines, that is! 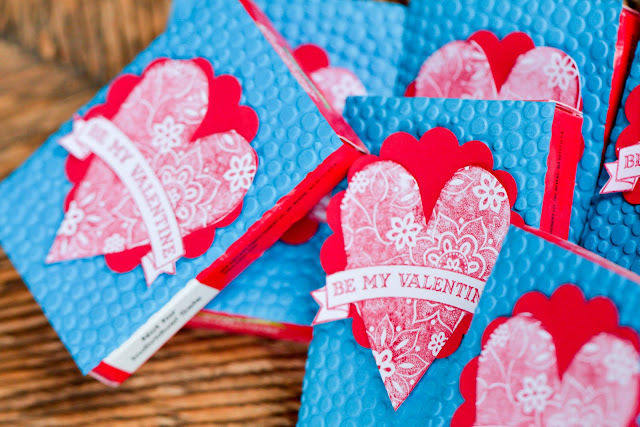 Valentines Day is the perfect opportunity to play with all my stamps and stuff, and at the same time show my dear ones how much I love them. 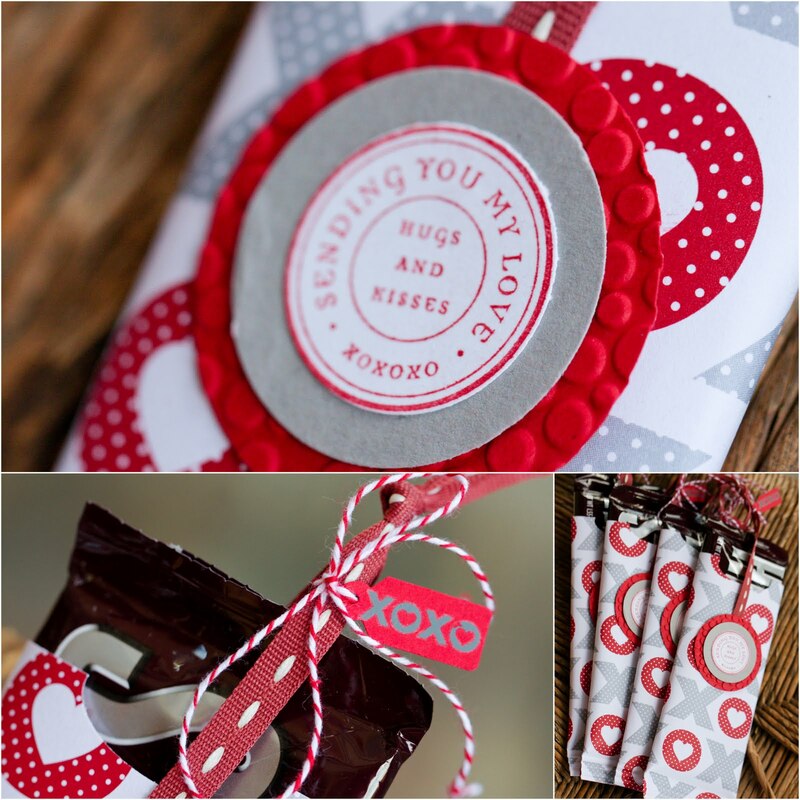 And when I make valentines, there is always chocolate and candy involved, of course - another motivating factor. I was anxious to try my new Petal Cone die for my Big Shot which makes this perfectly adorable cone shaped box! I just love the red and white wide striped ribbon and the crinkly gold paper! 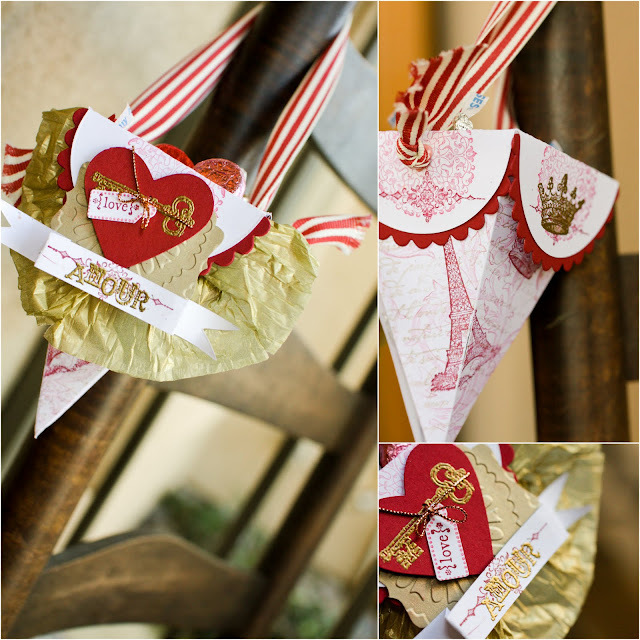 Crowns, the Eiffel Tower, and the key to my heart - so very French! This Valentine is so ME! Amour!!!! I also made these candy bar holders. So fun and easy. XOXO! When you pull up on the ribbon, the candy bar pops out! What's not to LOVE? 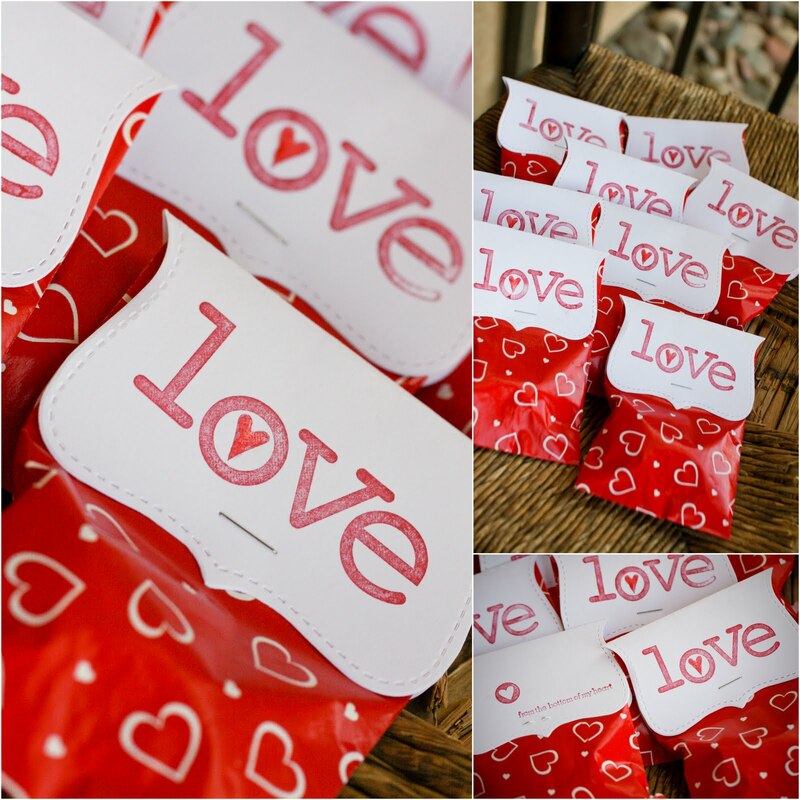 For the kids in my seminary class, I made these cute little baggies. 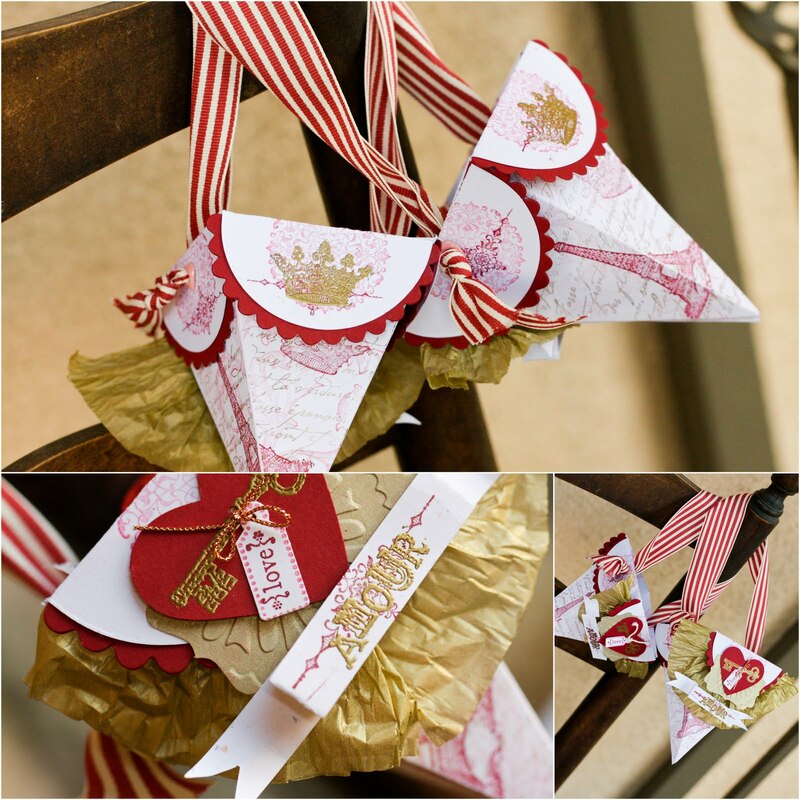 I found the small paper bags on clearance years ago, thinking I could do just such a project. The toppers are just cut with my Top Note die. The heart is shiny and puffy using Crystal Effects. LOVE - from the bottom of my heart! 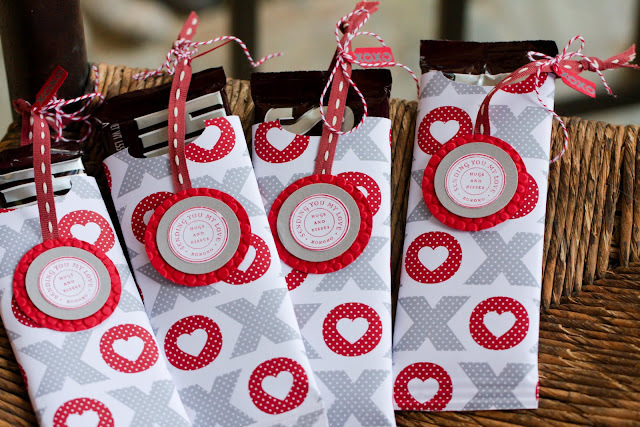 For my own kiddos, I simply dressed up some boxes of conversation hearts with my new Be My Valentine stamp, the jumbo scallop circle punch, and a bubbly texture folder on my Big Shot! I (heart) my boys: Alex, Nate, Derek, Dylan, Caleb, and Luke! 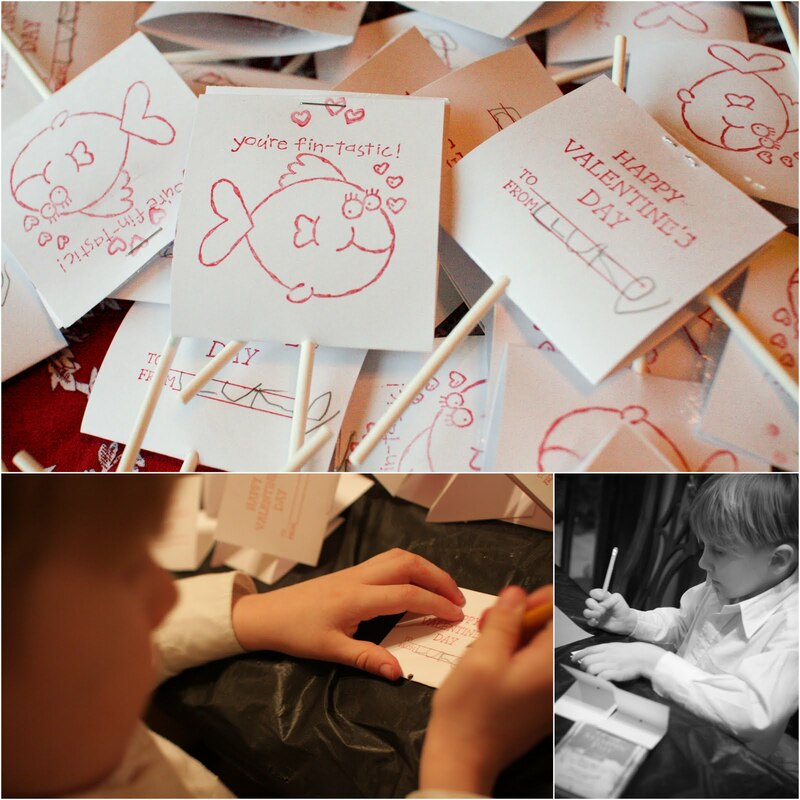 My younger guys also made their valentines for all the kids in their classes. It is a tradition. We make these every year, and have since my highschooler was in preschool - lollipop holders. They are quick and cute, and the kids do most of the work themselves. Caleb and Luke worked so hard on them. It was so fun to watch. Both crafters after my own heart! 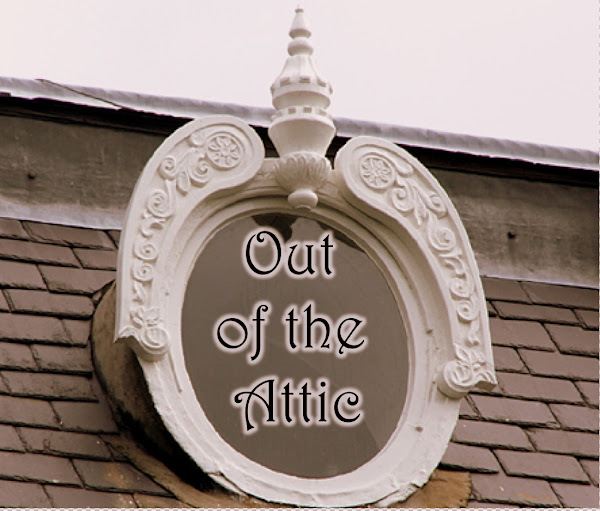 Happy Valentine's Day, my fellow Attic Diggers! Hope you just feel the love! 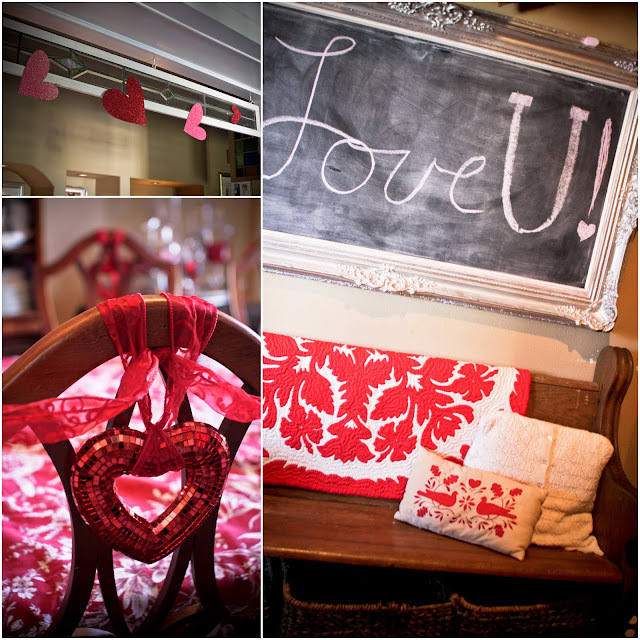 I LOVE decorating for Valentines Day! 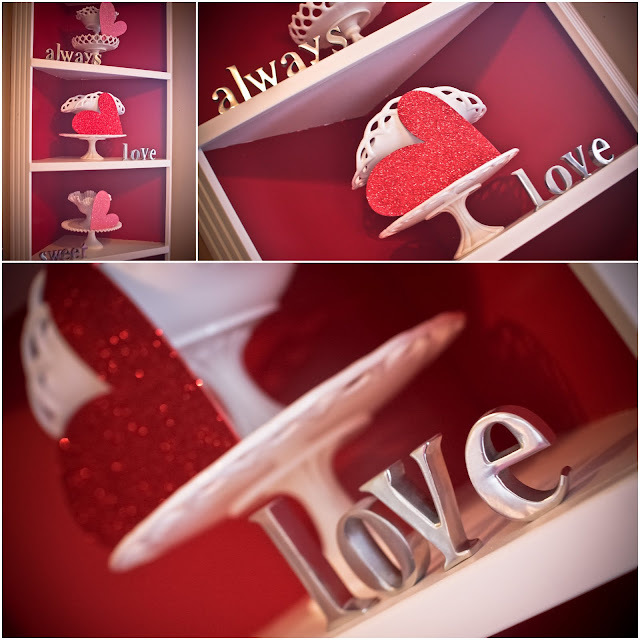 Red is one of my favorite colors and I have a lot of it in my home, so it is a perfect fit for my glittery Valentines decor. I especially love this corner built in that is painted red inside. It is a perfect backdrop for my milk glass and it is easy to spell out the love we all feel this time of year! 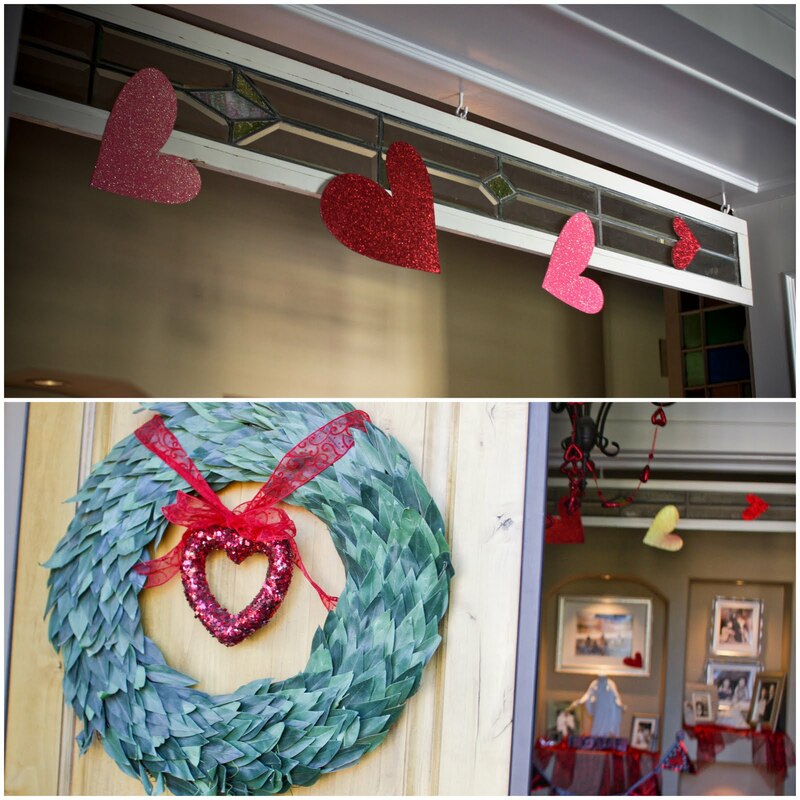 The bay wreaths I have up all year on the front doors, are given a bit of love with sparkly hearts and ribbon! Look up! Some large glitter hearts I got at after Valentine's day clearance add some great color overhead. 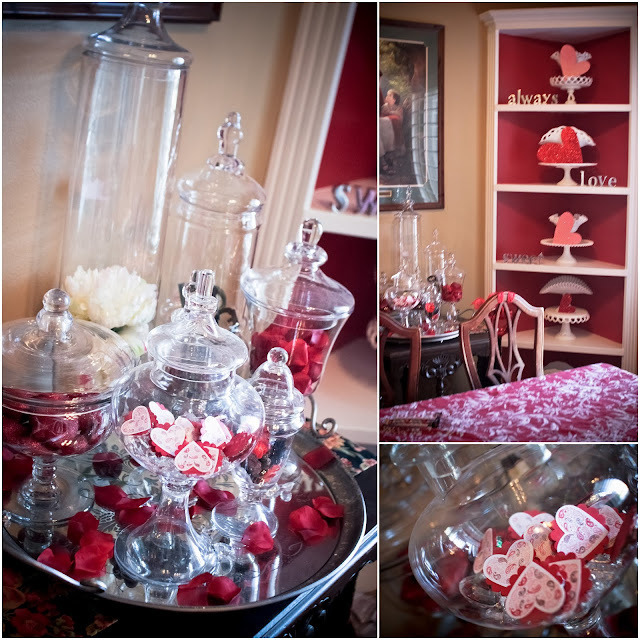 In the dining room, next to the corner cabinet are a huge mirrored platter full of apothocary jars filled with rose petals, flowers, cherries, glittered hearts, keys (to my heart, of course) and giant acrylic diamonds, along with some pretty valentine mints that I stamped for friends. 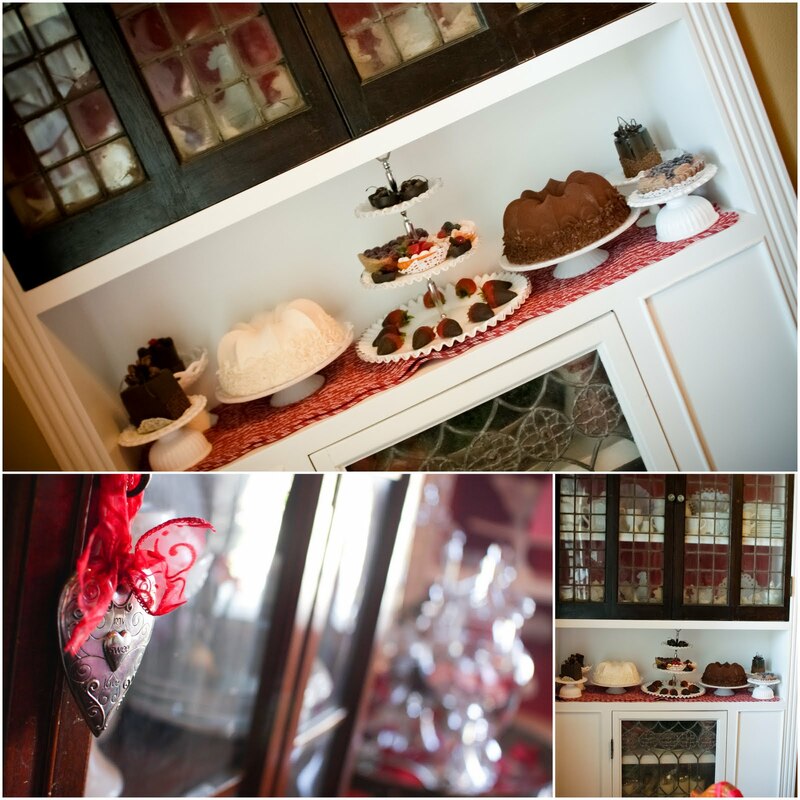 On the other built-in hutch is a spread of delicious desserts, cakes, and chocolates. They are all fake, unfortunately, but look just like the real deal! The message on the chalkboard is a simple one. Love U! Underneath it the church pew, one of my very favorite things, is dressed with a red and white Hawaiian quilt and some fun pillows. 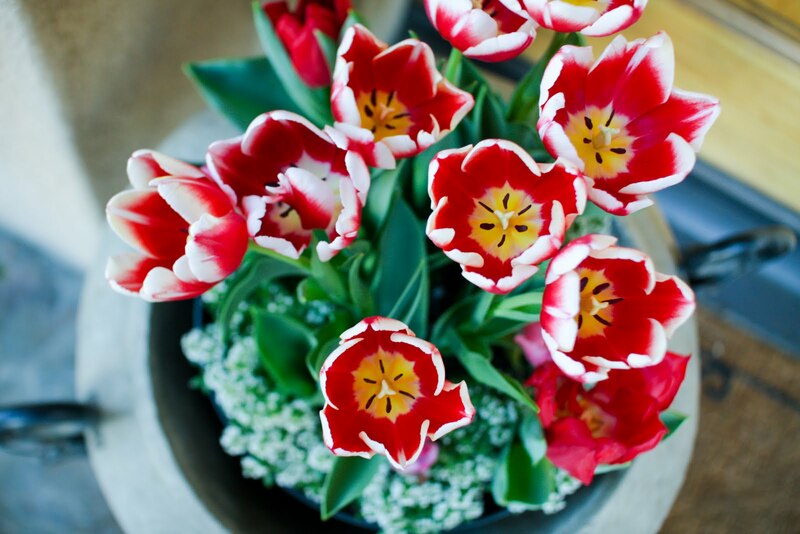 On the front porch, in the big urn, I put a pre-potted bunch of red and white tulips, that, although they are usually thought of as more for Easter decor, seem to work perfectly here for Valentines Day. Have a love-filled Valentines Day! May it sparkle! I love Valentines Day, and I adore making handmade valentines! 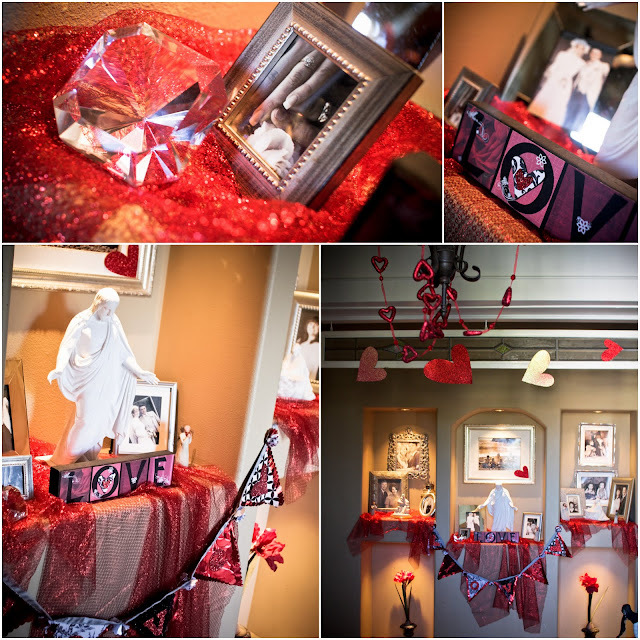 It is so much fun to see what I can create for all the people I love. This year I thought it would be so fun to invite my friends over to create valentines of their own with me. 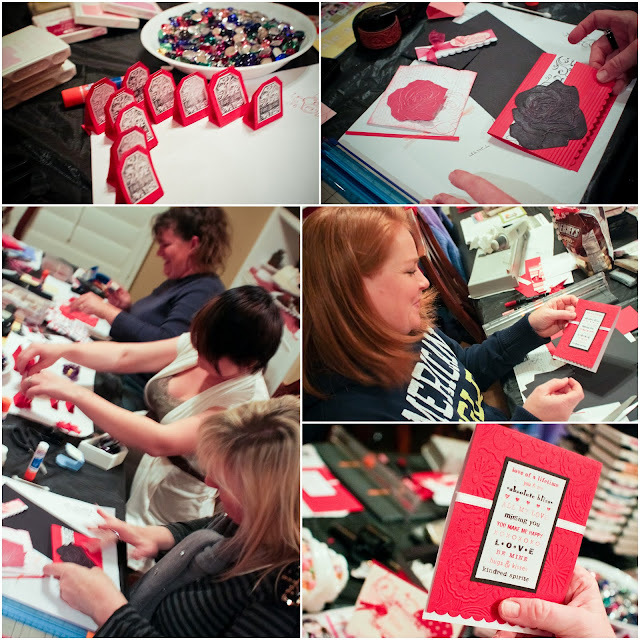 Crafting is always so much more fun with friends! 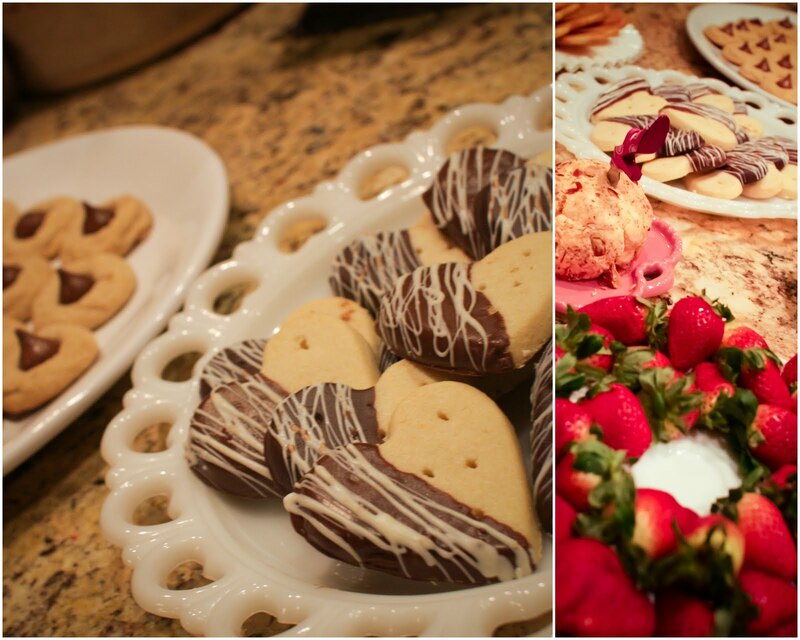 The refreshments were easy, but oh, so lovely. Everything was pink and red, heart-shaped or kissed! 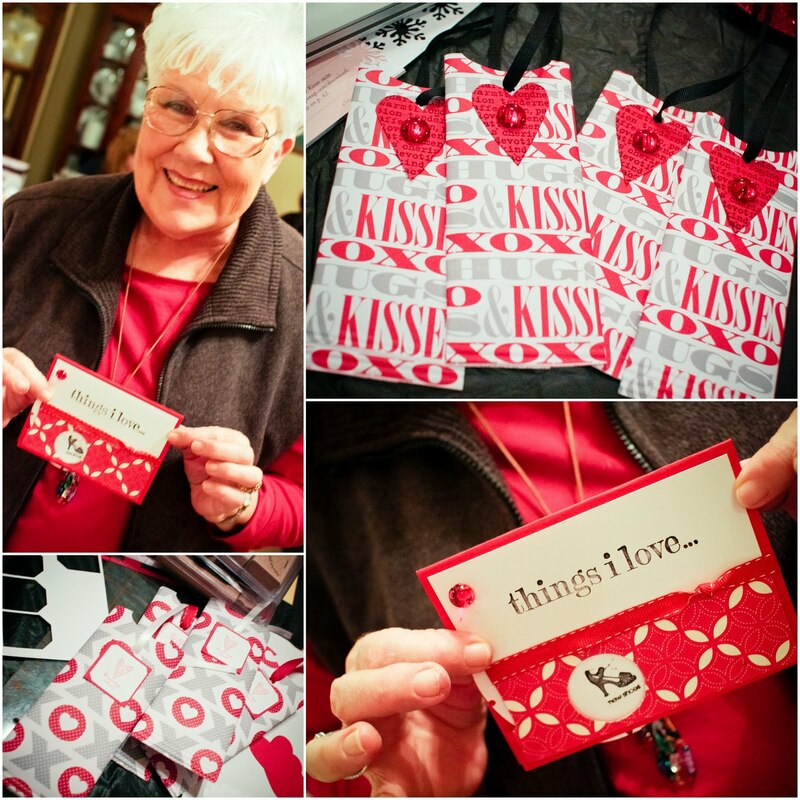 As were all the crafting supplies, and the fun projects the ladies made with them! 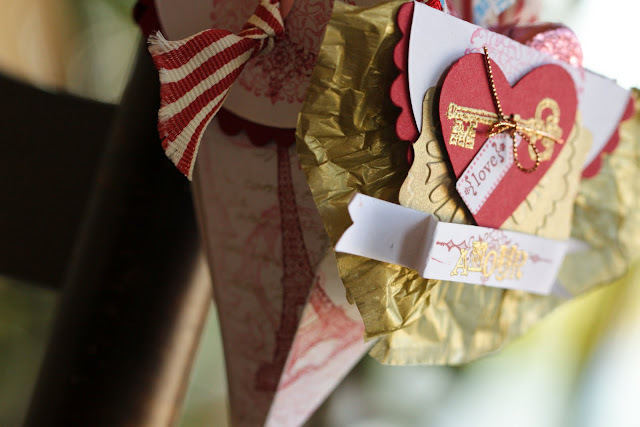 I brought out all my stamps, inks, scissors, dies, jewels, ribbons, wheels, and papers that could possibly be used for making Valentines. They ladies could make whatever they wanted - One and only fancy card for their one and only, or a bunch of little ones for all their little ones. Above are some candy bar cases and a viewmaster card. Some did their own thing using their own imaginations inspired by all the fun stuff at their disposal, and others copies some samples I had almost exactly. It didn't matter where their ideas came from - they all made some wonderful creations! Everyone had a great time, and there are gonna be some very lucky recipients of these beautiful tokens of love come Monday! 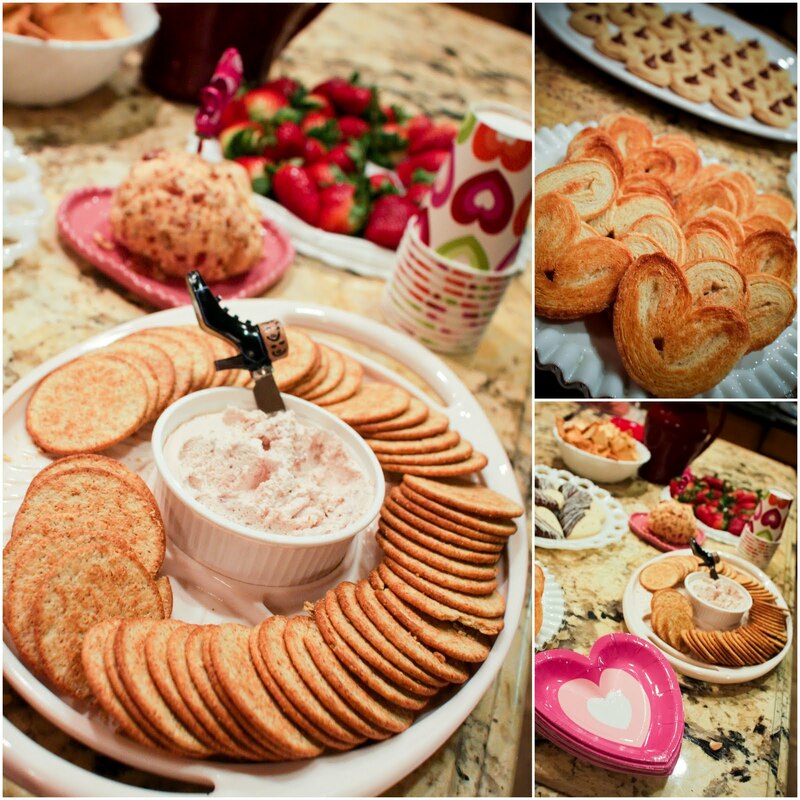 I might have to make a Build-your-own-Valentine party a tradition!